After an intensive research in the 100 CC segment I had to opt for Bajaj Platina. Why you’ll find it later. The great contenders included some models from TVS, Hero Honda, LML which may even fall in the 125 CC class but I had to choose a cool bike with great mileage. As the advertisement states it has killer looks and the style with 108 KMPL fuel efficiency. It states 108 KMPL but currently in the first month has given only 50-60 KMPL, it was stated by the company that it will give only upto 55 KMPL before the first servicing. I have rode 600 KMs in about a month, I really want to witness how it performs overtime. The killer looks include premium alloy wheels, matt finished black silencer, sporty console, sleek chrome graphics, graphite tinted engine and transmission and chrome streaked side panels. With the new exhaus-TEC engine it is bound to perform well. The SNS suspension does give you a great riding pleasure. The handling and braking is very good in this brand new stage but it will be tested as the time passes. 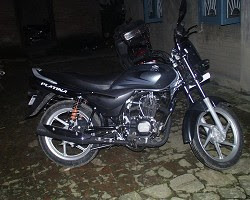 From almost all angles the bike resembles Wind 125 but has no self start like the Discover. It does make heads turn but if it had a self start it would have been a complete bike. I assume it’s built on the old caliber engine which has power for sure but does make the irritating gear shift sounds. With a tank capacity of 13 liters I’m freed from going to the petrol pump almost every alternate day as I used to ride the Hero Honda Street Smart with tank capacity of just 3.5 liters I suppose. It has a mild sound not like the bold sounds of the Hero Honda model’s but doesn’t lack the always needed pickup and speed. The first gear is very powerful, but again clutch balance is what I didn’t learn easily on this machine. Small things to consider, the rubber pad on foot brake is a very good small addition that caught my attention. The ride control on/off does work, it can be used to shift from economy and power mode formidably. The leg guard is very primitive so it had to be upgraded. Again the gear shifting makes lots of noise, the chain cover also emits unneeded noise. The gear shifting lever is pushed inside, which leads to the plastic styling being scratched by the shoes when gears are changed. The kick is regular L shaped which is easy to kick rather that the C shaped kick we find in Discover, but it should not affect as discover has self start. The side lamps as of all the Bajaj models are over stretched, looks very good but is prone to breakage. Tyres have no such defect till date; the ride experience on the whole is a good one. Reading above paragraph you might think I regret the decision of buying this baby, but not I’m a very good critic as people say. The price of one lakh two thousand Nepali currency (equate to Rs. 63750 IC, which you people can get in a lot cheaper now at Rs 34000 IC, its very expensive here in Kathmandu, Nepal because of all the taxes) is well set for this motorbike. I love the alloy wheels and the bike’s performance even in busy roads. The bike has good speed when it comes to riding in the open roads. I have traveled around 60 KMs in a single day but the bike showed no sighs of slowing down which I liked, I know it is also because it is new. Battery is also performing standard though I have put this bike under the rain few times but it hasn’t given any trouble. The side lamps switch is hip to operate, the key cover in ignition and fuel tank is logical. The oil indictor under the engine is a feature that is unique to this model. The horn also sound ok, it is not too sharp and irritating like that of the Pulsar or Discover. « OLPC A distant Dream?